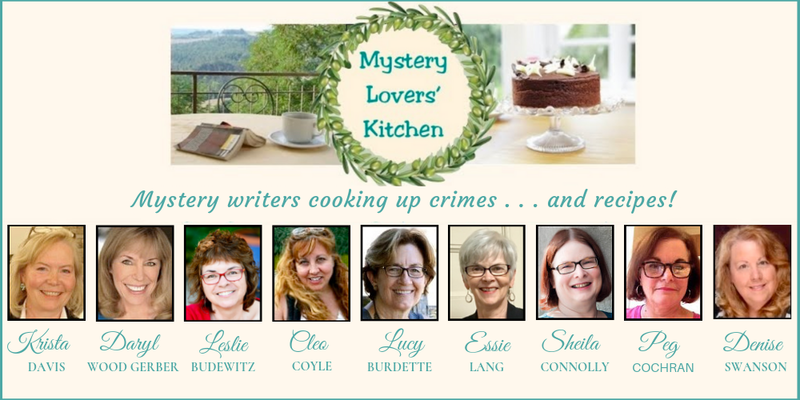 Mystery Lovers' Kitchen: Welcome guest Janet Rudolph! Please welcome guest, Janet Rudolph! 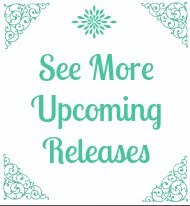 Some of you know me from the Mystery Readers Journal and my blog Mystery Fanfare , but I also blog daily at Dying for Chocolate. Many years ago I read The Five Year Sentence by Booker Prize winner Bernice Rubens. In it a woman who works in a sweets (candy) factory is preparing for her last day of work. She’s cleaned her house, and she’s checked the oven. Everything is ready, we’re sure, for her return from the day when with nothing left to do in her life, she will return home and turn on the gas. However, fate intervenes, and she is given a 5 year diary as a retirement gift. It’s as if she’s been given ‘a five year sentence’. She feels she has an obligation to fill in each day. The novel takes some imaginative turns, and Bernice Rubens, who was also a mystery author, should be sought out and read. Sometimes I feel like the woman in the story…not the suicide bit… but being given a ‘purpose’ to do what I do. When I started my Chocolate Blog, DyingforChocolate.com, I followed a similar thought process, and although I do random posts such as chocolate reviews, chocolate news and recipes as they strike me, for the most part I post recipes that coincide with the Food Holiday of the Day. They’re at the top of my ‘diary’. Be sure and search DyingforChocolate.com for more Food Holidays and easy and delicious recipes. 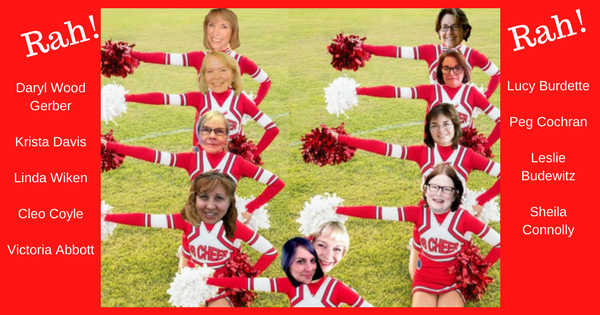 As well as writing chocolate posts to fit a particular holiday, I do something similar on my mystery blog, Mystery Fanfare. 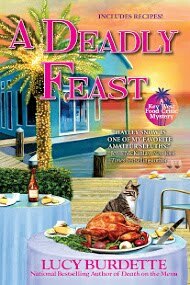 On Mystery Fanfare, along with posts about the mystery world in general, I am drawn to dates and holidays and make extensive lists of titles that fit the holidays. Have a look at my Christmas Crime Novels list that is so big this year that I’ve divided it into 5 posts. I’ve also posted Halloween Mysteries, Fourth of July Mysteries, Father’s Day Mysteries and lots of other holidays. I suppose I’m still in school with the teacher giving me a topic to use as a springboard, or as in Rubens’ novel, a day in a diary to fill in. I’m so lucky to write about my passions chocolate and crime fiction! This isn’t to say I don’t stray a bit with reviews and recipes ‘off list’, but for the most part I find it fun to fulfill the day and holiday… in mystery and in chocolate. I get into a bit of a Zen state when I’m writing and researching a holiday post. So, you might say my whole life is about mystery and chocolate. How sweet it is! Here’s a wonderful and easy recipe for the holidays! It coincides with December 24: National Eggnog Day! 1. Heat the eggnog over medium heat almost to the boiling point, stirring constantly. Do not boil. 2. Immediately remove pan from heat, turn heat to low. Add chocolate and butter to eggnog. Stir until chocolate is completely melted, returning to low heat if necessary. 3. Pour mixture into mixing bowl and beat with electric mixer at high speed for 5 minutes. 4. Refrigerate for 1 hour or until mixture is firm but pliable. 5. In small bowl, mix superfine sugar with nutmeg and cinnamon; set aside. 6. Scoop out about 1 teaspoon of chocolate mixture and roll into a ball (or use a melon baller and mold), then roll each ball in sugar mixture. 7. Place truffle on baking sheet covered with parchment. 9. You can store truffles in airtight container in refrigerator for up to a week, but they’ll probably all be eaten, so you won’t need to worry! Wow! Janet, this was a wonderful post. Who knew there were so many holidays??? I'm still giggling at the insect one. Thanks for being our guest. Here is a Christmas treat because we have a guest...who among you are candy makers or bakers? Not professionals. But you love to get in the kitchen and make sweet things. Share what you bake or make in a comment. Not the recipe. The title. and if you think it fits a certain holiday, in honor of Janet, share which holiday. I'm giving away a free copy of THE LONG QUICHE GOODBYE today to someone who comments! If you've read the book already, you can give it to a friend! 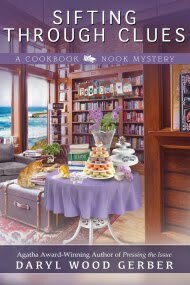 And last but not least...if you'd like to read a sneak preview of book two: Lost and Fondue, it is up on my website. Check it out at AVERY AAMES. While you're there, sign up for the mailing list and you'll be included in future contests coming up to promote Lost and Fondue. I had no idea there were that many chocolate-related holidays. I'll make a note to celebrate them this year and eat more chocolate! Dark chocolate eggnog truffles. These are definitely on my to-do list this week! Thanks for sharing. Of course, I'm also baking my grandmother's cookies and a Dulce d'leche cookie made with goat cheese. The gingersnaps are done. Hmmm, what else should I add to the list? How fun to log into one of my favorite blogs and find one of my favorite people. Hey, Janet! (Y'all this is the evil woman responsible for the extra pounds around my hips). Truffles. Yummmmm! Another great recipe - thanks, ladies!! Thanks for the great recipe Janet. Hi Janet!! 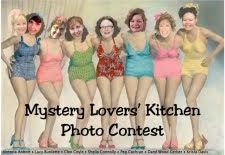 So happy to have you here on Mystery Lovers' Kitchen! As soon as I saw that Avery had invited you to be a guest, I smacked myself in the head and said, "Why didn't I think of that!!" Of course! I love your Tweets about mystery and chocolate. Really, is there a better combination? Thanks so much for this great recipe. Can't wait to try it. Greetings, Janet! What a fantastic, fun post. As you know, I’m a big fan of your blogs, both of them, and I have the perfect recipe to share with you today – one that would be appropriate for Mystery Fanfare as well as Dying for Chocolate (especially on National Espresso Day). The recipe is for Caffe Borgia. The drink is named after the notorious Borgia family, who poisoned their enemies with the drink. The taste of the arsenic was masked by chocolate and orange peel in the coffee. Here’s a quickie recipe: Stir one teaspoon of cocoa powder and a dash of cinnamon into your shot of espresso, top with whipped cream and garnish with orange rind. (Yes, I do suggest you hold the arsenic.) I’m so happy to see you in our *virtual* Kitchen. I can’t wait to try your eggnog truffles. Seems to me they’ll pair beautifully with an after dinner espresso (sans arsenic, of course). Yesterday, I made fantasy fudge and chocolate chip cookies. I think those fit National Chocolate Chip Day (May 15.) I also made M&M cookies. That should work well for National Chocolate Covered Anything Day (Dec. 16.) Great looking recipe. Thanks. I love to make cherry dream bars for Christmas. The dark chocolate eggnog truffles look amazing!!! National Blueberry popover day? That's unique! 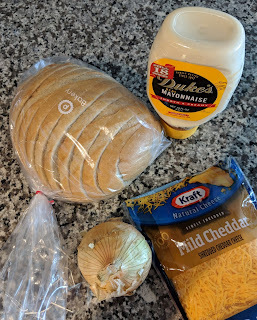 I just committed to writing a blog for Janet on National Cheese Fondue Day in April! I like to try new things. This year, I'm going to make a Hungarian Nut Roll - and really though we had it for Easter every year, I'm making it for Christmas. Elizabeth, every day is chocolate day! Kaye, hoped you'd be stopping by. Eggnog Truffles as so simple to make, so good to eat... and healthy! forget the pounds... worth it! Julie, love your White House Chef books. Just finished Buffalo West Wing. Loved it! Was thinking of you the other day when I saw the HGTV special on the White House decorations, and they went behind the scenes into the white house kitchen.. pastry chef making and decorating several thousand cookies! Cleo, love the arsenic recipe. The Borgias, no less! Yes,I can see where the orange peel would mask the flavor.. Have to try your recipe, without the arsenic! Love learning new poisonous things. I have a chocolate garden, and I used to have a poison garden, as well. Not anymore..
LSU Reader, need the recipe for those fudgy chocolate chip cookies. Sound fabulous! PoKoCat, what are cherry dream bars? Any chocolate in them? recipe? Thanks for stopping by the kitchen! 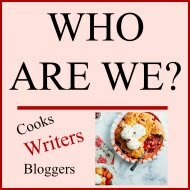 Love your recipe and your blogs! What a delight! I'll pass on the scorpions, though. It is days like today that I truly wish I loved chocolate!! 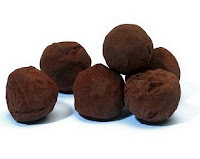 Obviously I have a big mix-up in my genetic code ;-) But both kids and Mr Nanc LOVE chocolate so I will make these lovely sounding truffles as well as the espresso truffles. I just got myself a little stovetop espresso maker so it will be good practice...I'll make espresso and watch them oohh and Ahh over their truffles!! Along with a wee glass of coffee mead and I should be good! Thanks so very much and have a blessed Christmas!! Love your recipes Janet, specifically the Espresso Truffle recipe! Yum! I love love love to bake! Two of my favorite things to make around Christmas (well, actually year around:) are Luscious Lemon Cookies and Orange Pumpkin Cookies! I'm late today, so sorry. I'm thrilled to see you here, Janet! Did you see George Geary's Quadruple Chocolate Chip cookie recipe? I made some today from my stash in the freezer -- delicious! It's been years since I made homemade chocolate truffles. Oh yum. Eggnog sounds like a wonderful ingredient, too. I always enjoy your posts, tweets, and recipes, Janet. Now, I'm searching for a copy of A Five Year Sentence. Thanks for the tip, it sounds like a book I'd enjoy reading. Pumpkin Cake for Christmas - filled with lots of spices like nutmeg and ginger - smells readily associated with the holidays. Yum! Pattie, I don't have George's recipe, but I'm going to find it! 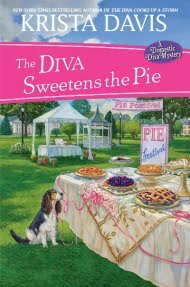 Pattie, I think there's another title for the Bernice Rubens.. something like The Sweet Shoppe.. but I couldn't find it online. Everyone, thanks for such a great welcome. Enjoyed being a Guest here! Love this blog!